MHT of North Carolina, Inc. Since 1980, MHT has been developing, specifying, and installing special-application video systems. Often, our designs draw elements from different disciplines and technologies. Our systems are optimized to meet your needs, fit your budget, and to deliver a technically correct and durable product. 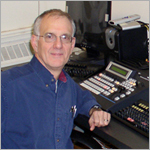 If you need to create, transmit, record, or display video and audio content, call MHT. We can make it happen, we can make it affordable, and we can make it better!